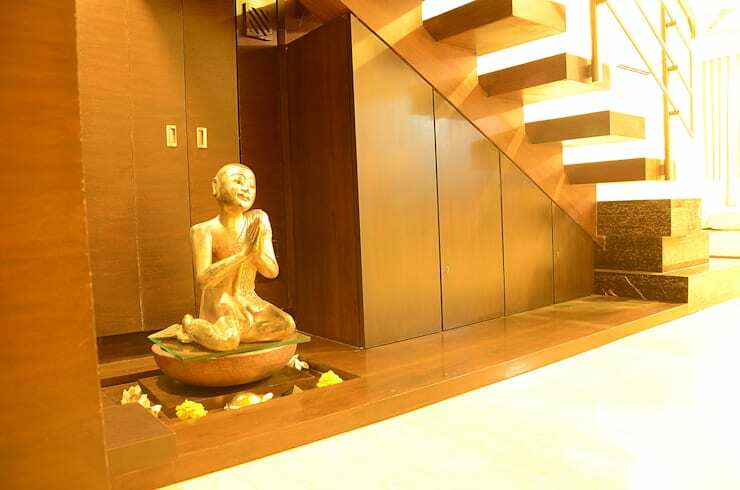 This lovely home has been designed by the interior designers and decorators of Aesthos Interior Design and Consultancy, Mumbai. 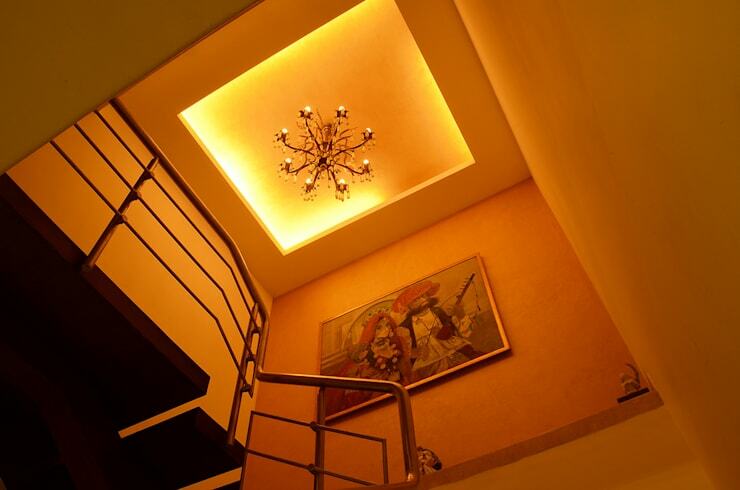 The interiors of your home should be designed based on your individual tastes. It is not necessary to stick to one style or design as it is possible to blend a couple of different styles to arrive at your own unique version. This home here is a lovely example of the same as the living room, dining and staircase areas have been designed to look ornamental, traditional and modern all at once. This is a lovely space dedicated to welcoming visitors. Space has been designed in wood but it does not look excessive or overwhelming. One of the reasons for this could be the open area and the minimalistic approach to the same. A lovely artefact sits beautifully below the stairs creating a lovely aura. 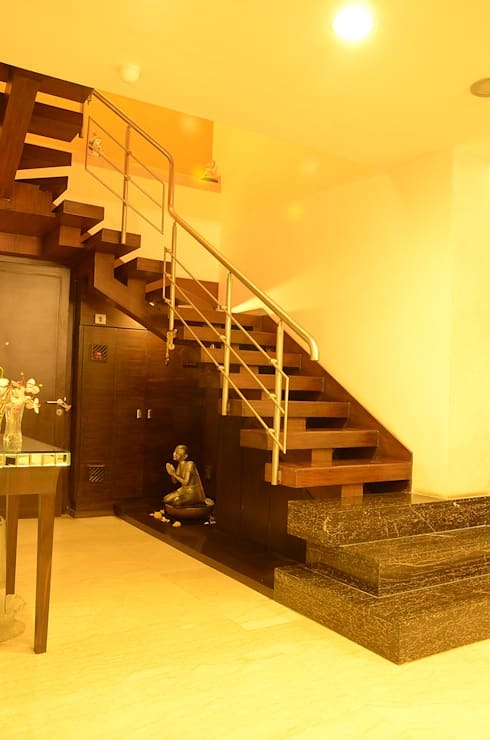 Designing staircases is an art which the designers have accomplished exceptionally in this case. Wood stairs look the most wonderful in any home. The stairs here have been contrasted well by the use of metal for the balustrade. The lighting and the soft colour on the walls support the look beautifully. 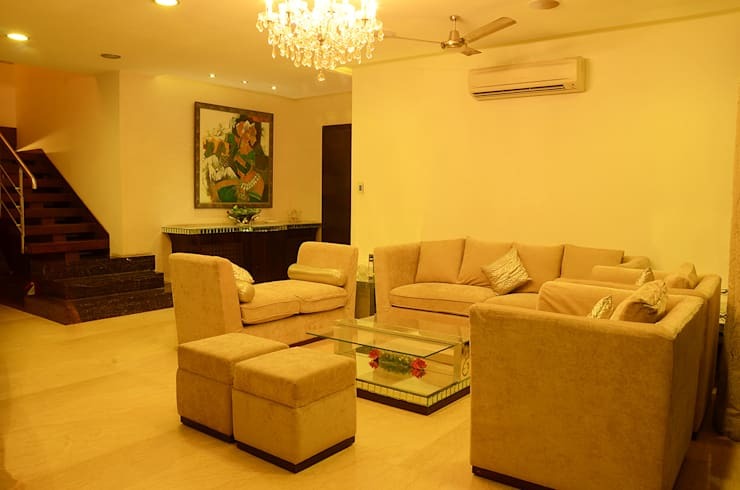 The soft look of the room has been contributed by the yellow lighting and simplistic style of the off-white sofas. The unique design of the sofa contributes to the cosy feel of the room. A modern cabinet sits against the wall and the deep colour of the wood contributes to the rich feel of the room. A simple yet modern chandelier provides lighting while adding to the soft and luxurious look of the room. 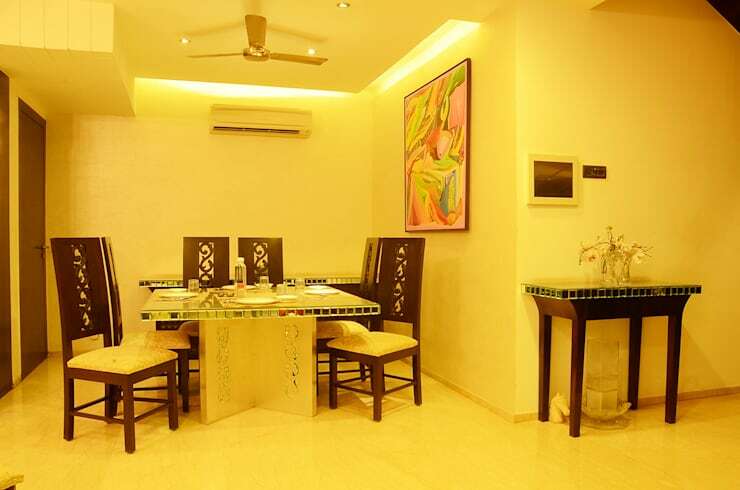 This small and compact space has been designed as a dining room. The lovely use of wood that has been contrasted with white furnishings has given this room a soft yet sophisticated look. A lovely, colourful artwork hangs on the wall brightening up the entire space. This is a lovely dresser that has been curated for this room. A large mirror that sits against the wall has been made versatile as it also features a lovely chest of drawers along with a simple drawer that functions as a storage unit. This is the perfect unit for a modest bedroom. 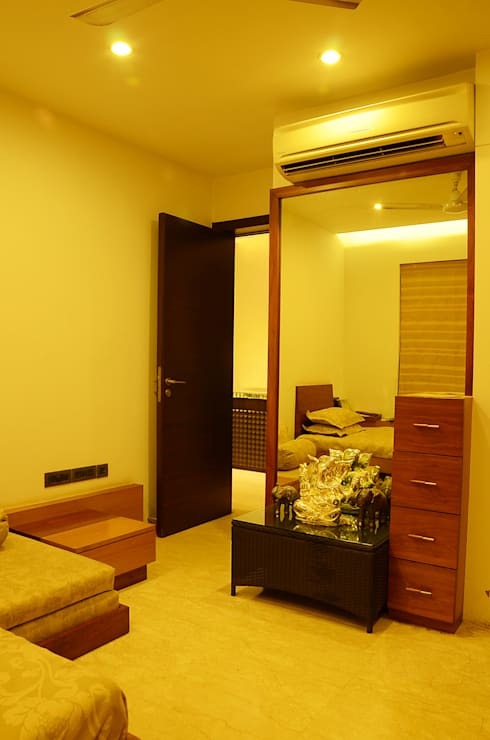 The soft lighting and the simplistic style of the bed add to the beauty of the room. 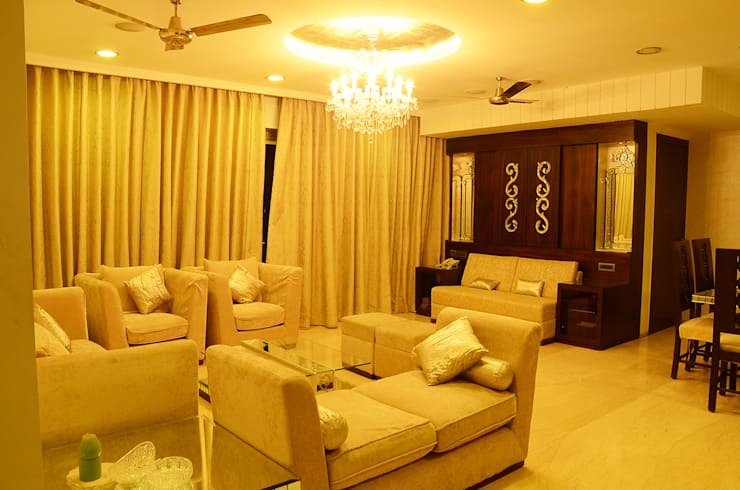 Take another tour— Stunning Living and Dining Room Designs in Gurugram.